Hutchison Vale put on a goal scoring show to claim all three points in this Division 1 League Cup tie at a windy Meggetland after going behind against a plucky Leith Athletic side who only had ten outfield players available. Hutchie started the game brightly passing and moving the ball well around the park in the opening minutes but they found themselves going behind with only five minutes on the clock when Fraser Murdie fired home with a fine finish to the keepers left hand side from18 yards out to put the visitors in front. Gregor Lamb lined up a free kick for the home side around 25 yards out but his effort went high and wide of the right hand post. Seven minutes into the half Lewis Reid had to be replaced by Mitchell Haddow in the Leith goal after taking unwell and Haddow's first action was to pick the ball out of his net a minute after coming on after Dale Skinner's low driven shot found the left hand corner to get the home side back on level terms. Leith's Jack Enguidanos tried his luck from distance but the wind held up the ball which Bryan Cairns collected comfortably. The home side started to find their rhythm and and get their one, two touch passing going but a moment slackness in the midfield allowed Murdie to rob his opposite number and play a ball in for Zak Mason who forced Cairns into a superb save to tip the ball round the post. The home side got their noses in front on the 21st minute after Haddow pulled of a good save from Lamb's initial shot but he could only palm it out and Skinner was on hand to put the rebound away with the Leith defence rooted to the spot. Lomond Gray was next to have a bash from 18 yards but Haddow collected at the second attempt for the Leith men but it was not long before he found himself beaten again. A free kick to the right of goal 28 yards out saw Hutchie's Ceiran Dunne step up and blast the free kick over Haddow and into the roof of the net leaving the goal keeper with no chance with 28 minutes gone. Hutchie were flying now and they increased their lead four minutes later when Dunne saw his effort come of the junction of the post and bar and Ferrier reacted quickest to finish from six yards out. Dunne then went close but his shot went wide of the post and then Ferrier came close after a good run through the centre of the Leith defence but put his shot just over the bar. With five minutes to half time Leith pushed forward and were rearded with a free kick 30 yards out. Enguidanos lined up the free kick and struck the ball well forcing Cairns to get down low to his left to save. The visitors next chance came from a corner on the right which was played in by Murdie with Evan Glendinning going for the spectacular bicycle kick finish but failed to make contact, then the ball was played back to Murdie who saw his shot saved. Hutchie had a good penalty claim in the last minute when Ferrier through on goal took the ball around Haddow who made contact with the Hutchie man and brought him down but referee Townsley waved Ferrier's penalty claim aside and blew for half time. Hutchie got the second half underway and were straight back on the attack and the home sides first chance came when Callum Bielski played a ball across to Daniel Nichol but he blasted over the bar before being deemed off side. Skinner and Ferrier were pressurizing the Leith back line at every opportunity and it was Skinner who played a long ball across goal for Ferrier but he could not get the contact he needed from his outstretched leg to force the ball home and saw the ball go agonizingly wide of the post. Ferrier was then involved again when he received the ball on the edge of the 18 yard line and twisted and turned Matthew Keddie inside out and after the ball went wide Keddie lashed out at Ferrier with a wild kick. The referee showed the culprit a yellow card but in all honesty it could have easily been red for Leith's central defender. Bielski was next in line but his 18 yard drive was straight at Haddow but it was only delaying the inevitable and Hutchie got one the score sheet again on 51 minutes after Dunne picked up the ball and from 20 yards out finished superbly with a low driven shot into the right hand corner for his second of the game leaving Haddow rooted to the spot. Two minutes later Leith found themselves further behind after Dunne squared the ball to Ferrier who produced the near exact same finish as his provider had scored minutes earlier. Leith were confined pretty much to their own half and were defending for their lives as the Hutchie attacks just kept coming and coming but the hard working Murdie sprang the off side trap after a long ball was played forward and when finding himself one on one with the keeper finished superbly. Hutchie got back to their one, two touch passing and Ferrier showed really good quick feet to evade several challenges but his shot did not trouble Haddow and it was Ferrier again who showed nice feet to create space to cross the ball into the box and Lamb's side foot finish from 2 yards out on 59 minutes was sublime. Still with half an hour of the match remaining Leith still believed and tried to play football and Zak Mason came close when his powerful strike from 20 yards out flew just over the bar. Cameron Coppola combined well with his keeper and somehow between them they managed to halt Skinners advance. It was becoming target practice for the home side with players having shots from in and around the box at every opportunity and this was to be the case on the 64th minute when Dalgetty hit a fierce strike in a central position 20 yards out to see the ball fly high into the net. Hutchie created chance after chance and it took the face of poor Leighton Rodgers to stop Skinner increasing his goal tally after the Hutchie man's shot from a couple of yards out struck the Leith man full in the face, Bielski then came close but his shot from 16 yards out hit the post. Hutchies next opportunity came when they won a corner on the right hand side and Lamb played it short to Dunne who gave him it back and his cross to the back post was cleared by Leith's Rodgers but only as far as Bielski who fired home from 22 yards on 73 minutes. It was all hand to the pumps for Leith and they managed to hold back the home side's advances but with five minutes left Ferrier again became provider and played in Dunne who fired into the side netting much to the annoyance of his team mates who were waiting for the cut back to tap the ball home. Haddow had to be brave to deny Ferrier from two yards but then Ferrier showed some good work in the box was shut down but the ball somehow found it's way through to Skinner on the right who finished from six yards to complete the rout and claim his match hat-trick. 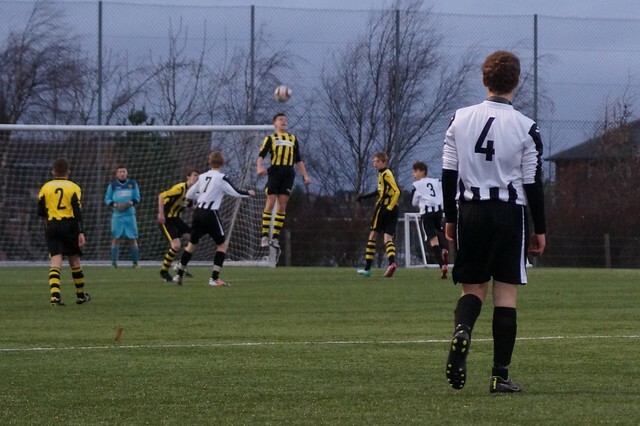 Leith gave their all and could not be accused of letting their heads go down or giving up but Hutchie were just to good on the day and scored some cracking goals into the bargain. Cieran Dunne was superb down the left hand side and his balls into the box caused all sorts of problems for Leith but he was also a goal threat which he showed bagging two goals. Fraser Murdie was the stand out player for Leith and fully deserved his two goals for the performance he put it and showed a great work rate and never stopped running the whole game. Dale Skinner's 79th minute goal to claim his match hat-trick and top off a super individual performance. Fraser Murdies's second goal was the result of timing his run perfectly to stay on side.